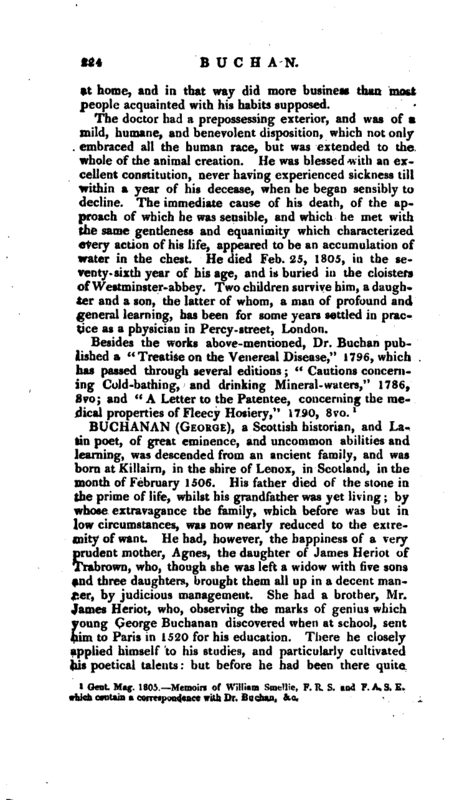 , a medical writer of great popularity, descended of a respectable family in Roxburghshire, was born at Ancram in the year 1729. Having passed through the usual school education, he was sent to the university at Edinburgh. His inclination leading him to mathematics, he became so considerable a proficient in that branch of science, as to be enabled to give private lessons to many of the pupils. Having made choice of medicine for his profession, he attended the lectures of the several professors, necessary to qualify him for practice;, and as he was of a studious turn of mind, his progress ia knowledge may be supposed to have been equal to his application. | After having passed a period of not less than nine years at the university, he first settled in practice at Sheffield, in Yorkshire. He was soon afterwards elected physician to a large branch of the Foundling hospital then established at Ackworth. In the course of two years he reduced the annual number of deaths among the children from one half to one in fifteen; and by the establishment of due regulations for the preservation of health, greatly diminished the previously burthensome expense of medical attendance. In this situation, he derived from experience that knowledge of. the complaints, and of the general treatment of children, which was afterwards published in “The Domestic Medicine,” and in the “Advice to Mothers;” works which, considering their very general diffusion, have no doubt tended to ameliorate the treatment of children, and consequently to improve the constitutions of the present generation of the inhabitants of this country. 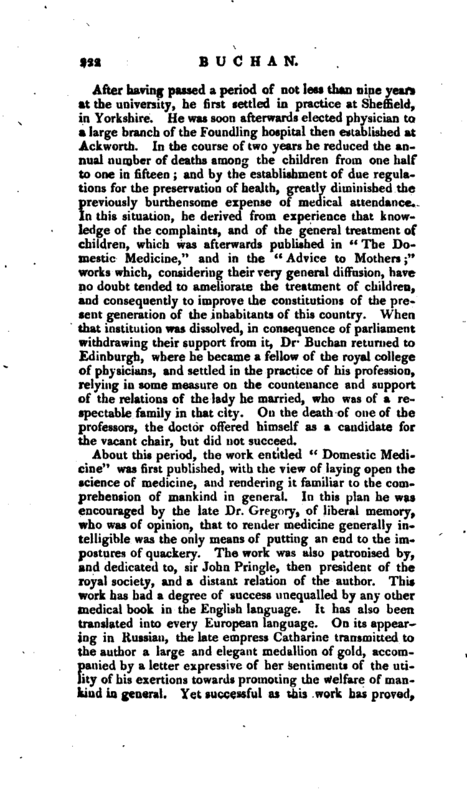 When that institution was dissolved, in consequence of parliament withdrawing their support from it, Dr Buchan returned to Edinburgh, where he became a fellow of the royal college of physicians, and settled in the practice of his profession, relying in some measure on the countenance and support of the relations of the lady he married, who was of a respectable family in that city. On the death of one of the professors, the doctor offered himself as a candidate for the vacant chair, but did not succeed. About this period, the work entitled “Domestic Medicine” was first published, with the view of laying open the science of medicine, and rendering it familiar to the comprehension of mankind in general. In this plan he was encouraged by the late Dr. Gregory, of liberal memory, who was of opinion, that to render medicine generally intelligible was the only means of putting an end to the impostures of quackery. This work was also patronised by, and dedicated to, sir John Pringle, then president of the royal society, and a distant relation of the author. This work has had a degree of success unequalled by any other medical book in the English language. It has also been translated into every European language. On its appearing in Russian, the late empress Catharine transmitted to the author a large and elegant medallion of gold, accompanied by a letter expressive of her sentiments of the utility of his exertions towards promoting the welfare of mankind in general. 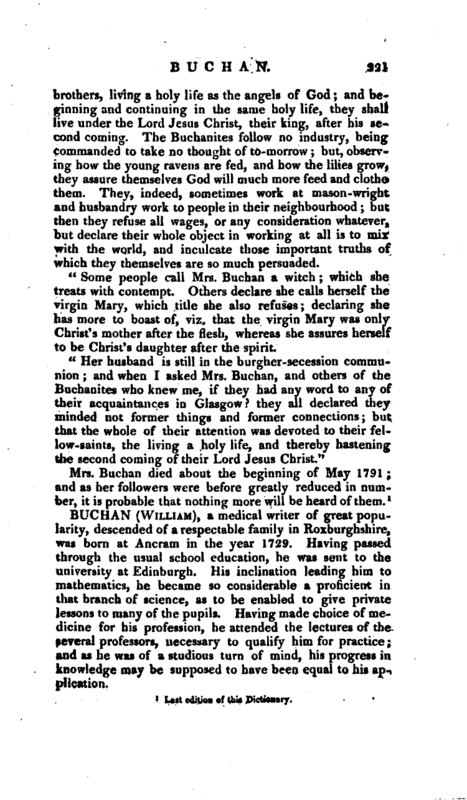 Yet successful as this work has proved, | Dr. Buchan’s expectations from it were not great, and he sold the copyright in 1771 for a very inconsiderable sum but the liberal purchaser, the late Mr. Cadell, and his successors, made the doctor a handsome present on revising each edition, of which he lived to see nineteen published, amounting to upwards of 80,000 copies. It has likewise been printed in Ireland and America, and pirated in various shapes in England, but without much diminution either of the sale or credit of the authentic work. 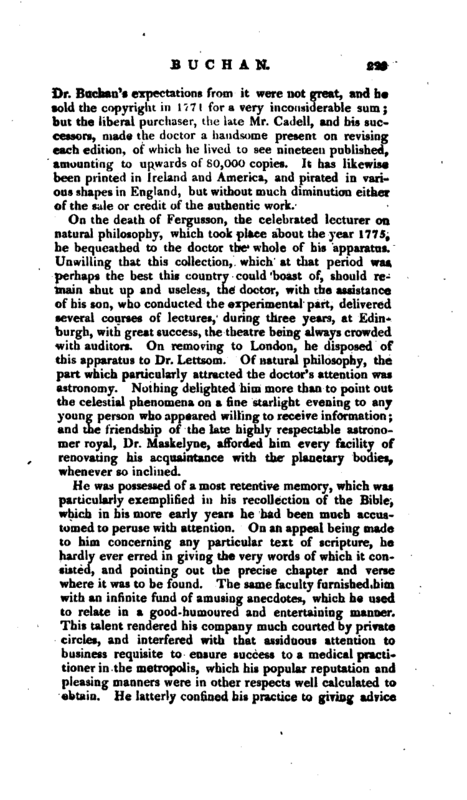 On the death of Fergusson, the celebrated lecturer on natural philosophy, which took place about the year 1775, he bequeathed to the doctor the whole of his apparatus. Unwilling that this collection, which at that period was perhaps the best this country could boast of, should remain shut up and useless, the doctor, with the assistance of his son, who conducted the experimental part, delivered several courses of lectures, during three years, at Edinburgh, with great success, the theatre being always crowded with auditors. On removing to London, he disposed of this apparatus to Dr. Lettsom. Of natural philosophy, the part which particularly attracted the doctor’s attention was astronomy. Nothing delighted him more than to point out the celestial phenomena on a fine starlight evening to any young person who appeared willing to receive information; and the friendship of the late highly respectable astronomer royal, Dr. Maskelyne, afforded him every facility of renovating his acquaintance with the planetary bodies, whenever so inclined. He was possessed of a most retentive memory, which was particularly exemplified in his recollection of the Bible, which in his more early years he had been much accustomed to peruse with attention. On an appeal being made to him concerning any particular text of scripture, he hardly ever erred in giving the very words of which it consisted, and pointing out the precise chapter and verse where it was to be found. The same faculty furnished him with an infinite fund of amusing anecdotes, which he used to relate in a good-humoured and entertaining manner. This talent rendered his company much courted by private circles, and interfered with that assiduous attention to business requisite to ensure success to a medical practitioner in the metropolis, which his popular reputation and pleasing manners were in other respects well calculated to obtain. He latterly confined his practice to giving advice | at home, and in that way did more business than most people acquainted with his habits supposed. The doctor had a prepossessing exterior, and was of a mild, humane, and benevolent disposition, which not only embraced all the human race, but was extended to the whole of the animal creation. He was blessed with an excellent constitution, never having experienced sickness till within a year of his decease, when he began sensibly to decline. The immediate cause of his death, of the approach of which he was sensible, and which he met with the same gentleness and equanimity which characterized every action of his life, appeared to be an accumulation of water in the chest. He died Feb. 24, 1805, in the seventy-sixth year of his age, and is buried in the cloisters of Westminster-abbey. Two children survive him, a daughter and a son, the latter of whom, a man of profound and general learning, has been for some years settled in practice as a physician in Percy-street, London. 1 Gent. Mag. 1805. Memoirs of William Smellie, F. R, S. and F. A, S. B, which contain a correspondence with Dr. Buchaa, &c.